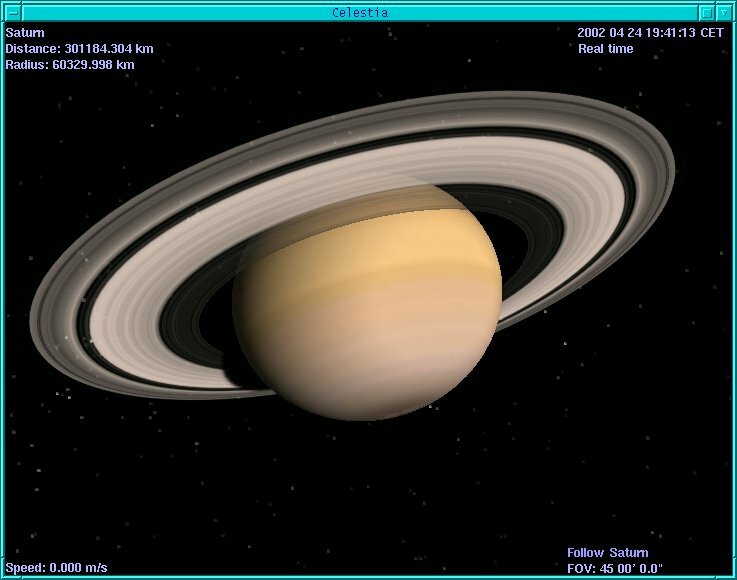 Celestia and Open Universe are programs that let you travel through the universe and explore all the planets and stars. If you ever looked upon the sky at night dreaming of flying through space visiting all those bright shining stars and planets you will love them! Both are real time programs, that means that you can view all the planets and stars move along their paths, trace them and orbit them. With Celestia you can go on a space travel and explore our universe. 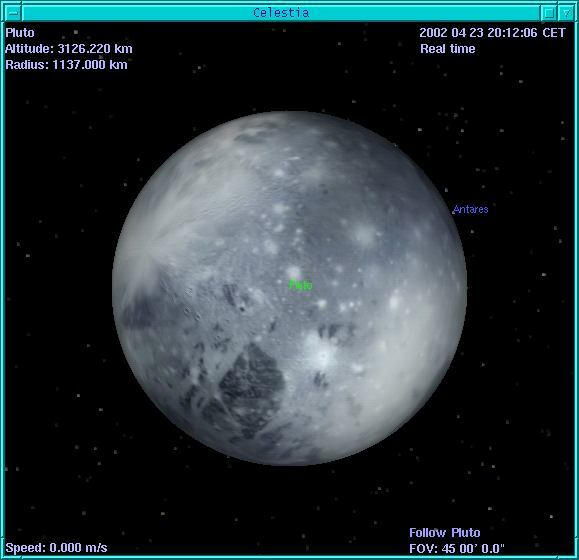 When you start the program you will first see Jupiter's moon Io. The voyage can begin. But when you run the program for the first time you should first make a guided tour and go on a demo flight by pressing d-key. You will leave Earth and see some very nice pictures of our blue planet. Next is the moon, followed by pictures of the sun. Now you see the planets on their orbits. After this you travel to see Saturn, some star constellations and the milky way before going home again. There are several ways to navigate through space. 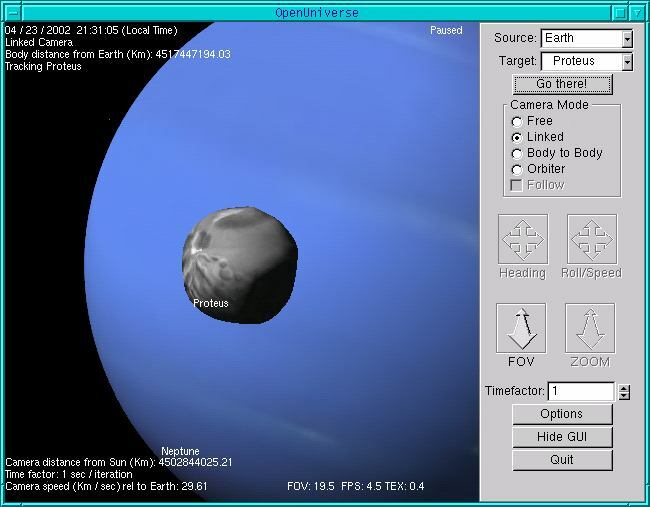 You can press the return key and enter the name of the planet, star or constellation. Then choose a travel speed (e.g. F2, F3) and press g-key. Off you go! You can also travel through the universe by clicking and dragging with the mouse and selecting an object with a left mouse click. If its name is then shown on the top left of the program window the object is selected. This is really a cool feature as you can select almost every point that you can see on your screen. Press c-key to get the selected object in the center of your window. Choose a travel speed if you haven't already done so and press g-key. You are now traveling to your selected object. By clicking g-key again you can get closer to it. With t-key you can track an object. 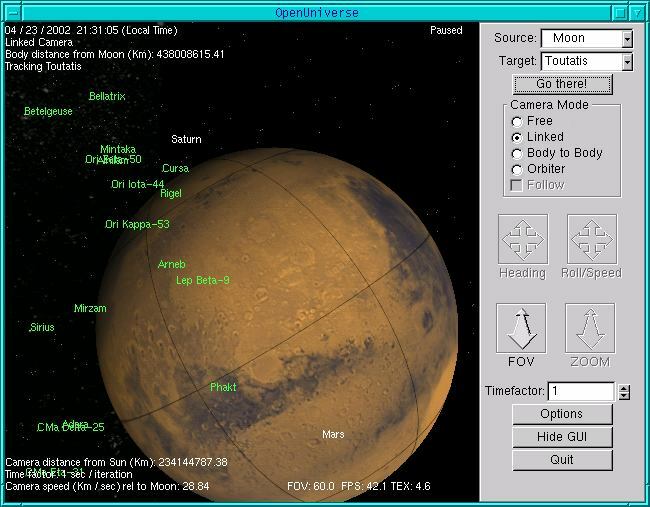 If you press n-key you get the names of the planets and moons, b-key gives you the names of the stars, = the constellation names and with v-key you get some information about your target. Pressing any of this buttons again lets disappear the names and information again. This information really is very useful for your orientation. A click on "h" (followed by "g" of course) brings you back to our sun which I find very helpful when I am lost in space once again ;-). You can select different travel speeds with F2 to F6 (F2 being the slowest). Pressing F1 stops everything. To get closer you have to press g-key again until you are as close as you want to. You can read "Traveling" written on the left bottom of the screen in addition to the moving stars and planets. With ESC you stop everything. To find out more read the Readme of the program which is included in the top level directory of the source code. If you prefer to read about the keybindings online then take a look at =>the keybindings page<=. The version used for this article was celestia-1.2.2. You can download it from the Celestia webpage (http://www.shatters.net/celestia/). The package, celestia-1.2.2.tar.gz, is about 10Mb big. To use it you need a 3D graphic card and the Mesa 3D graphics libraries. Packages, headerfiles and libraries should already be included on the CDs of your Linux distribution. The installation should be straight forward. Open Universe is a program similar to Celestia. It doesn't have that many stars and planets because it focuses on our solar system. It hasn't been updated for a while now as the people of OpenUniverse are busy helping with Celestia, but it has a nice navigation bar where you can choose your target from a list of planets, stars etc. so that you don't get lost that easily. I really think it is worth looking at, too. If you start it you will see some beautiful pictures of the earth. When using it for the first time you might also want to see a demo first. Click on Options (on the bottom of the menu) and an options menu pops up. Here you can choose demo mode. If you want to know the names of the stars and planets you are passing by make sure that you also have the options "info", "star labels" and "body labels" ticked. Now lean back and enjoy watching for a while. Okay, now it's time to go on a space exploration by ourselves! 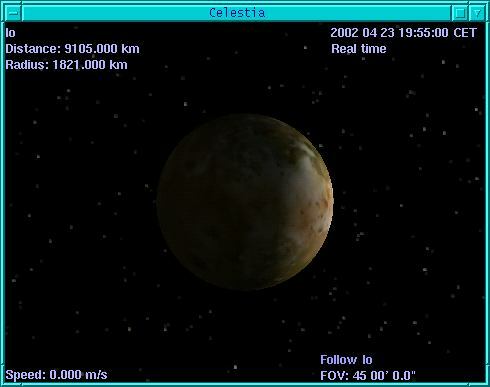 In OpenUniverse you are a bit more restricted than in Celestia but are also less likely to get lost in space that way. To navigate through space you choose an object from the source list and another from the target list. You can also set the camera mode. If you choose "body to body" you get a view from the target as seen from the source. If you choose "orbit" you orbit around the target. Now click "go there" and your voyage begins! You can read the manual to get more information on how to use OpenUniverse. If you need help while traveling pressing h will also give you some clues. The version used in this article was openuniverse-1.0beta3. You can download it from the OpenUniverse webpage (http://www.openuniverse.org/). The package, openuniverse-1.0beta3.tar.gz, is about 4Mb. It requires a bit of manual code change to get it compiled but it is really worth it. It is said on the installation page that the glui libs are optional but I could not get it to work without them. You get the glui_v2_1_beta sources at http://www.cs.unc.edu/~rademach/glui.